Car stuck in snow. 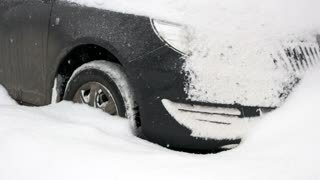 Wheel of car is stuck in snow. Driving and bad winter weather conditions. Driver digging out car stuck in snow. Bad weather conditions after snow storm. What to do when you are stuck in the snow. Grey passenger car stuck in snow. Close up wheel of car stuck in snow. Car after snow storm. Prepare your car for winter weather. 10. 01. 2018 - Kyiv, Ukraine. Passenger car stuck in the snow. Car stalled in the snow. Winter and bad weather conditions. Driving problems due to heavy snowfall. 10. 01. 2018 - Kyiv, Ukraine. 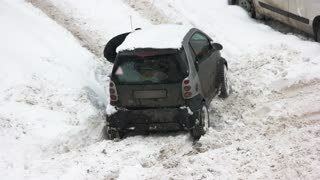 Man digs up stuck in snow car. Car wheel stuck in the snow. Driving in adverse weather conditions. Close up of car stuck in snow drift. Black car covered with snow after blizzard. 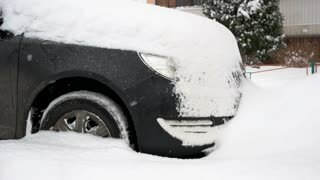 Prepare your car for cold weather conditions.